Visitors to Haverford College's newest building might think they've entered a state-of-the-art research facility, and they would be right. In October, the College celebrated the completion of the Marian E. Koshland Integrated Natural Sciences Center, a 188,000-square-foot, four-story complex where scientists and students are tackling problems in such cutting-edge research as nanoscience. The formal opening of the new science facility took place on Saturday, October 5, when Haverford College President Thomas Tritton welcomed members of Haverford's Board of Managers and many of the College's key alumni volunteers in the center's rotunda. Catherine Koshland, vice chair of the College's board was presented with keys to the new center followed by a ribbon cutting with Haverford biologist and center director Judith Owen and William H. and Johanna A. Harris, for whom a wing of the new building is being named. Named after a prestigious immunologist, the Marian E. Koshland Integrated Natural Sciences Center promises to be an impressive learning environment for Haverford students and an enviable research facility for the College's scientists who helped to design it. In thinking back to his own days as a chemistry student, Haverford President Tritton appreciates how much the new facilities in the sciences will enhance the students' overall education experience.“Strolling through the corridors, labs, offices and meeting spaces, you can't help but be impressed with the overall design of the science center and its seamless linkage of teaching and research spaces,” says Tritton. Construction on the $39.8 million center began in the summer of 2000 with a goal of bringing together the College's departments of chemistry, physics, astronomy, mathematics, biology, computer science and psychology into one complex. The decision to create a center that encourages interaction among students and faculty in the natural sciences reflects the fact that today's scientific problems and the methods for solving them often require collaboration between researchers from different disciplines. The“hub” of this new integrated science center is its laboratories. The teaching and research that occurs there represents what is unique about the science student's experience at Haverford. For the last 30 years, science majors have spent their third year in what's known as“superlab” – an intensive yearlong laboratory course built around substantial hands-on research with sophisticated equipment – an opportunity often reserved for graduate students at other institutions. Following their“superlab” experience, students take part in yearlong independent laboratory research projects in their senior year, often collaborating with faculty members on their own research. Prior to the construction of the Koshland Center, interaction among student researchers in different departments was hampered by their locations on different floors and in different buildings. At the faculty's request, all of the“superlabs” in the new facility were placed on the same floor. The new instructional research labs were designed with wider aisles and generous open space around common lab facilities such as dispensing and balance stations. Work stations such as those found in the general chemistry laboratory were designed so that shelving at the workbenches would not block sight lines. Each lab bench is divided into sections where groupings of four students can easily discuss their work without any physical barriers hindering their interaction. Notebook computers are available at each station where there are sensors for logging in data. In biology laboratories, students work at hexagonal-shaped lab stations angled in such a way that partners and groups ranging from two-to-eight students can more naturally collaborate with each other. Five separate computational spaces are now united into one science computer center where, as one faculty member notes, there should be a great deal of interaction among the students as they accumulate, synthesize and tabulate data for their projects there. Lounges located across from some of the instructional laboratories are directly outside faculty members' offices and shared by students and faculty alike. Toward the center of the complex, a larger lounge area serves as a venue for concerts, receptions, poster sessions and other presentations. 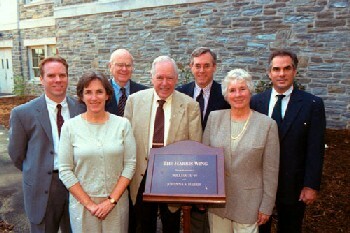 The Gilbert Fowler White Science Library, named in honor of a former Haverford College president, world-renowned geographer and environmentalist, now houses the majority of the College's science library collections and electronic and web-based data access. Events surrounding the formal opening of the Marian E. Koshland Center included talks by Harvard University chemist, George M. Whitesides, internationally renowned for his multidisciplinary approaches to nanoscience research. In addition to tours of the new facility, several student poster presentations were on display representing their research in physics, chemistry, biochemistry, biology, psychology and bioinformatics, as well as their clinical medical experiences and internships.